The situation detailed in the following AP article is currently being investigated, thus it is difficult to identify the full scope of this infiltration; regardless of the results of the investigation, what we see now is obviously unacceptable. The use of a secret police (NYPD assisted by the CIA) force to attack peaceful political organizations and religious groups is the antithesis of American values and a dangerous step towards a police state. It doesn't matter if you are liberal or conservative, this is an unacceptable attack on the rights of Americans and should be met with an independent inquiry. NEW YORK (AP) — Undercover NYPD officers attended meetings of liberal political organizations and kept intelligence files on activists who planned protests around the country, according to interviews and documents that show how police have used counterterrorism tactics to monitor even lawful activities. The infiltration echoes the tactics the NYPD used in the run-up toNew York's 2004 Republican National Convention, when police monitored church groups, anti-war organizations and environmental advocates nationwide. That effort was revealed by The New York Times in 2007 and in an ongoing federal civil rights lawsuit over how the NYPD treated convention protesters. Police said the pre-convention spying was necessary to prepare for the huge, raucous crowds that were headed to the city. But documents obtained by The Associated Press show that the police department's intelligence unit continued to keep close watch on political groups in 2008, long after the convention had passed. In April 2008, an undercover NYPD officer traveled to New Orleans to attend the People's Summit, a gathering of liberal groups organized around their shared opposition to U.S. economic policy and the effect of trade agreements between the U.S., Canada and Mexico. When the undercover effort was summarized for supervisors, it identified groups opposed to U.S. immigration policy, labor laws and racial profiling. Two activists — Jordan Flaherty, a journalist, and Marisa Franco, a labor organizer for housekeepers and nannies — were mentioned by name in one of the police intelligence reports obtained by the AP. "One workshop was led by Jordan Flaherty, former member of the International Solidarity Movement Chapter in New York City," officers wrote in an April 25, 2008, memo to David Cohen, the NYPD's top intelligence officer. "Mr. Flaherty is an editor and journalist of the Left Turn Magazine and was one of the main organizers of the conference. Mr. Flaherty held a discussion calling for the increase of the divestment campaign of Israel and mentioned two events related to Palestine." The document is available here: http://apne.ws/GGCBuX . The document provides the latest example of how, in the name of fighting terrorism, law enforcement agencies around the country have scrutinized groups that legally oppose government policies. The FBI, for instance, has collected information on anti-war demonstrators. The Maryland state police infiltrated meetings of anti-death penalty groups. Missouri counterterrorism analysts suggested that support for Rep. Ron Paul, R-Texas, might indicate support for violent militias — an assertion for which state officials later apologized. And Texas officials urged authorities to monitor lobbying efforts by pro Muslim-groups. Police have good reason to want to know what to expect when protesters take to the streets. Many big cities, such as Seattle in 1999, Cincinnati in 2001 and Toledo in 2005, have seen protests turned into violent, destructive riots. Intelligence from undercover officers gives police an idea of what to expect and lets them plan accordingly. "There was no political surveillance," Cohen testified in the ongoing lawsuit over NYPD's handling of protesters at the Republican convention. "This was a program designed to determine in advance the likelihood of unlawful activity or acts of violence." The result of those efforts, however, was that people and organizations can be cataloged in police files for discussing political topics or advocating even legal protests, not violence or criminal activity. By contrast, at the height of the Occupy Wall Street protests and in related protests in other cities, officials at the U.S. Homeland Security Department repeatedly urged authorities not to produce intelligence reports based simply on protest activities. "Occupy Wall Street-type protesters mostly are engaged in constitutionally protected activity," department officials wrote in documents obtained under the Freedom of Information Act by the website Gawker. "We maintain our longstanding position that DHS should not report on activities when the basis for reporting is political speech." At the NYPD, the monitoring was carried out by the Intelligence Division, a squad that operates with nearly no outside oversight and is so secretive that police said even its organizational chart is too sensitive to publish. The division has been the subject of a series of Associated Press articles that illustrated how the NYPD monitored Muslim neighborhoods, catalogued people who prayed at mosques and eavesdropped on sermons. The AP left phone messages with Cohen and two NYPD press officers last week seeking comment about the undercover operation in New Orleans. They did not return the calls. The NYPD has defended its efforts, saying the threat of terrorism means officers cannot wait to open an investigation until a crime is committed. Under rules governing NYPD investigations, officers are allowed to go anywhere the public can go and can prepare reports for "operational planning." Though the NYPD's infiltration of political groups before the 2004 convention generated some controversy and has become an element in a lawsuit over the arrest, fingerprinting and detention of protesters, the surveillance itself has not been challenged in court. Flaherty, who also writes for The Huffington Post, said he was not an organizer of the summit, as police wrote in the NYPD report. He said the event described by police actually was a film festival in New Orleans that same week, suggesting that the undercover officer's duties were more widespread than described in the report. Flaherty said he recalls introducing a film about Palestinians but spoke only briefly and does not understand why that landed him a reference in police files. "The only threat was the threat of ideas," he said. "I think this idea of secret police following you around is terrifying. It really has an effect of spreading fear and squashing dissent." Before the terrorist attacks of September 2001, infiltrating political groups was one of the most tightly controlled powers the NYPD could use. Such investigations were restricted by a longstanding court order in a lawsuit over the NYPD's spying on protest groups in the 1960s. After the attacks, Cohen told a federal judge that, to keep the city safe, police must be allowed to open investigations before there's evidence of a crime. A federal judge agreed and relaxed the rules. Since then, police have monitored not only suspected terrorists but also entire Muslim neighborhoods, mosques, restaurants and law-abiding protesters. Keeping tabs on planned demonstrations is a key function of Cohen's division. Investigators with his Cyber Intelligence Unit monitor websites of activist groups, and undercover officers put themselves on email distribution lists for upcoming events. Plainclothes officers collect fliers on public demonstrations. Officers and informants infiltrate the groups and attend rallies, parades and marches. 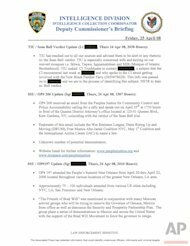 Intelligence analysts take all this information and distill it into summaries for Police Commissioner Raymond Kelly's daily briefing, documents show. The April 2008 memo offers an unusually candid view of how political monitoring fit into the NYPD's larger, post-9/11 intelligence mission. As the AP has reported previously, Cohen's unit has transformed the NYPD into one of the most aggressive domestic intelligence agencies in the United States, one that infiltrated Muslim student groups, monitored their websites and used informants as listening posts inside mosques. Along with the political monitoring, the document describes plans to use informants to monitor mosques for conversations about the imminent verdict in the trial of three NYPD officers charged in the 2006 shooting death of Sean Bell, an unarmed man who died in a hail of gunfire. Police were worried about how the black community, particularly the New Black Panther Party, would respond to the verdict, according to this and other documents obtained by the AP. The document also contained details of a whitewater rafting trip that an undercover officer attended with Muslim students from City College New York. "The group prayed at least four times a day, and much of the conversation was spent discussing Islam and was religious in nature," the report reads. Eugene Puryear, 26, an activist who attended the New Orleans summit, said he was not surprised to learn that police were monitoring it. He said it was entirely peaceful, a way to connect community organizers around the issues of racism and the rights of the poor. But he described it as a challenge to corporate power and said the NYPD probably felt threatened by it. "From their perspective, they need to spy on peaceful groups so they're not effective at putting out their peaceful message," he said. "They are threatened by anything challenging the status quo." Do the Occupiers Need Demands? What Century are we living in?